Tick bites are normally of minor consequence; however, ticks are important vectors. Ixodes sp. 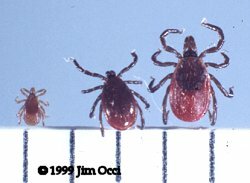 are hard ticks and transmit the agents of Lyme disease and babesiosis. I. scapularis is shown at right (nymph, male, and female). Image courtesy of Jim Occi.